Part one of the 'Brioche Knitting' series included detailed instructions on how to work the 'brk' and 'sl1yo' stitches which are the foundation of brioche. 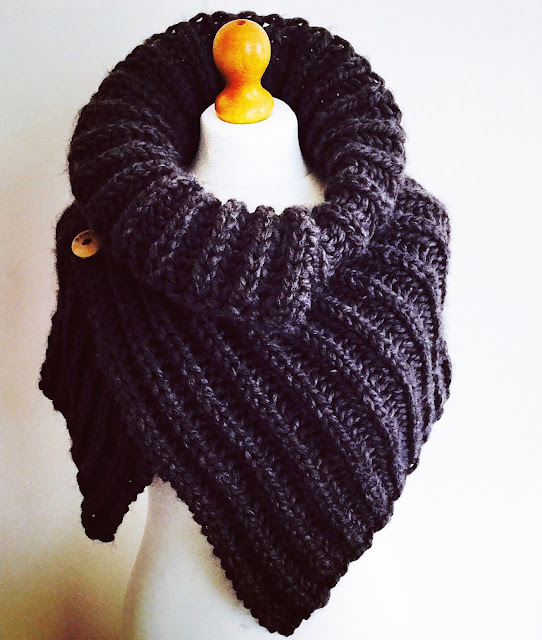 I also showed you the wrap I made as my first brioche project. Today I'll tell you how to make it. The one-colour rib wrap is essentially an up-scaled swatch - it is made in exactly the same way, just with more stitches and rows. 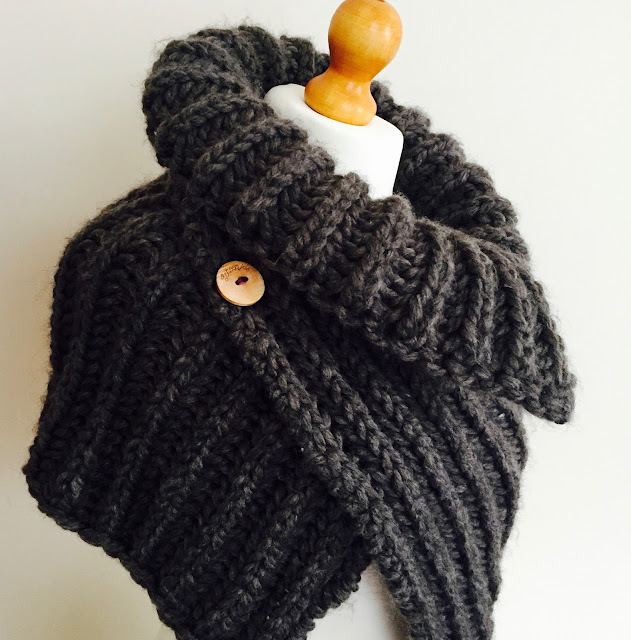 As it's knit with big yarn and needles, it can be finished in a weekend or a few evenings, giving you a sense of accomplishment as well as a warm snuggly accessory! By the time you've made the wrap you should be ready to move onto the next stage which is two-colour brioche rib. Are you ready? Let's go! 300g / 225m Scheepjes Peru ❣ in shade '70' - it looks different in every light! 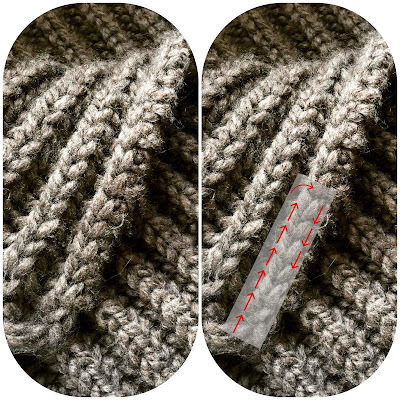 The stitches and cast-on/bind-off are all detailed in the first post in this series. If you haven't read it, please go back and do so before continuing, or this post probably won't make sense. - When changing to a new ball of yarn, be sure to do so at the beginning of a row, leaving a tail of at least 15cm for sewing in (attempting to sew the ends in mid-row is very tricky with this reversible fabric). - The first stitch of each row is slipped, and the last stitch of each row is knit through the back loop. When you have bound off, the yarn tails should be threaded into these stitches (not too tight!) to finish off, as indicated by the arrows in the image below. They become invisible! I've been wearing this all week - I love that it can be worn as an extra over-shoulder layer indoors and adjusted to wear beneath a coat too. Simple versatile knits are always a winner with me. I hope you enjoy yours too. COMING SOON: How to knit a two-colour brioche rib swatch! ❣ Many thanks to Scheepjes for supporting this series. In the UK, Scheepjes yarns are stocked at Deramores and Wool Warehouse. Find a full list of international stockists here. Thanks for the pattern. This looks so stylish and cosy!